Everyday, communities are at risk of transmissible diseases and growing epidemics. There’s so many places and diseases that it’s difficult to keep up of the status of global health. The freely available HealthMap keeps track of this impossible feat. HealthMap brings real-time information on an hourly basis from thousands of different sources with over 90% accuracy. All this information results in a real time disease map. With this health locational map, you can find out what health issues are happening where. You can collect the disease, location name and number of cases. These location patterns can be mapped and analyzed to help understand the risk of spreading. HealthMap is a real time disease map that has become an international source of recognizing and assisting in the fight of the spread of epidemics. It’s accessible to travelers and parents with timely information. This can help prepare and become more educated of possible diseases. HealthMap was founded by Boston’s Children’s Hospital in 2006. 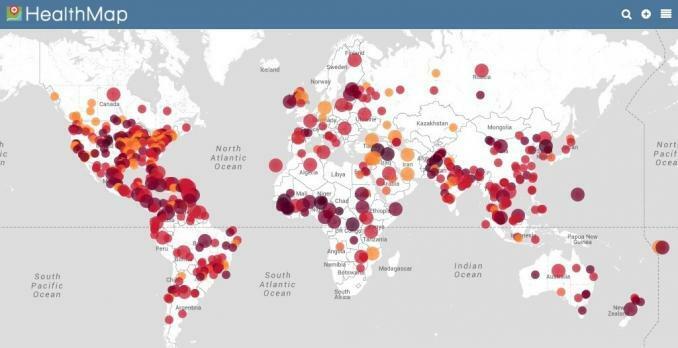 It was developed by a team of software engineers, researchers and epidemiologists to provide locational information of disease outbreak globally.